Eventzilla is a solution designed to streamline event registration and ticketing tasks. It is created for all kinds of gatherings and events and it assures the organizers of successful events using its mobile-friendly ticket selling interface and powerful registration platform. Eventzilla helps you boost your profits by reaching more targeted customers. You can also lessen the occurrence of no-shows, as the software ensures that registered attendants are reminded of your event so your seats won’t be left empty. Furthermore, the software also assists you in the aspect of managing the data of your attendees by allowing them to access their own information. Through this, you and your attendees can save more time and you can focus more on selling tickets. The software has a portal that attendees can use to view and edit their data and download tickets even without your assistance. This capability effectively fosters better engagement with event participants while reducing your workload. The software allows you to gain insights about your attendees and know what they think about your events. The app helps you with this through post-event surveys that you can configure with custom questions and reports. Through Eventzilla, you and your attendees can have peace of mind that all your financial data is safe. The software handles payments via secure processing portals like Stripe, PayPal, Braintree, and Authorize.net. Through these gateways, participants can buy tickets without needing to input sensitive financial information on the ticketing page. 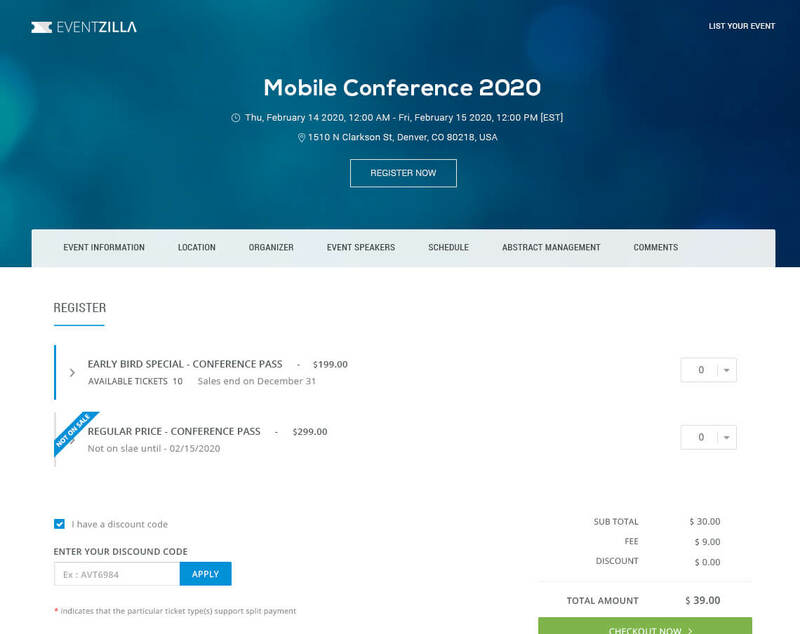 As an economical ticketing and event registration tool, Eventzilla is free for all free events while for paid events, you only have to pay a $1 fee per attendee. This enables you to save money as you don’t need to pay anything for the months that you don’t have planned events. You can reach more of your target audience with Eventzilla. It is integrated with leading social media platforms such as Twitter and Facebook for better visibility among your followers and fans. Besides that, Eventzilla is also integrated with event organizers’ sites, allowing you to sell more tickets and increase profitability as your scope has no limitations.